OverviewA 1987 arcade game. 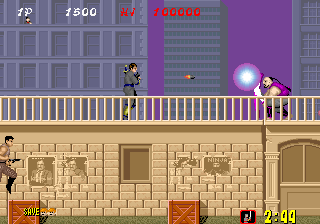 The player takes control of Joe Musashi, a master ninja whose mission is to rescue all of the hostages. SEGA's innovative ninja game predating Ninja Gaiden for the NES includes challenging platforming, first person mini-games, and scalable difficulty. Now you can add videos, screenshots, or other images (cover scans, disc scans, etc.) for Shinobi (set 2, System 16B) (FD1094 317-0049) to Emuparadise. Do it now!